If there is such a thing as a Counting God of Symphonic Composition, then no one had a more ardent faith in that deity than Gustav Mahler. When he composed Das Lied von der Erde (The Song of the Earth), the Viennese master thought he had outwitted the Counting God. Spooked by the knowledge that Beethoven, Schubert and Bruckner all had died after composing their ninth symphonies, and having just completed his eighth, Mahler avoided numbering the next one. Rather, the subtitle of Das Lied von der Erde reads: A Symphony for Alto, Tenor and Large Orchestra, absent a number.Mahler, perhaps feeling his deceit a triumph, went on to compose a ninth symphony. Alas, after unfinished sketches for a tenth, Mahler died, his name added to the victims of the Counting God after all. Das Lied von der Erde, completed in 1909,is a six-movement symphonic song cycle set to the texts of classic Chinese poems published a few years before in a German-language adaptation by the poet Hans Bethge. The Counting God superstition aside, Mahler set out composing this work in 1908, on the heels of great professional misfortune and personal tragedy. In March of 1907, Mahler resigned his post as Director of the Vienna Court Opera. The virulent rise of anti-Semitism in Vienna’s society, fueling a vitriolic press campaign against him, made it impossible to continue his directorship. Then, a few months later, in July, while vacationing with his family in Maiernigg, his elder daughter, Maria, or “Putzi”, fell ill with scarlet fever and diphtheria. On July 5, she passed away. She was four years old. Adding to these cruel fates, and while still grieving, Mahler learned that he had a serious, potentially life-threatening heart condition. It is no wonder, then, that Mahler, by his own admission, considered Das Lied von der Erde his most personal creation. Bethge’s text, translated from 7th and 8th century Tang Dynasty poetry, spoke deeply to Mahler. The verses embody themes of grief, loneliness, the beauty of nature, the renewal of springtime, and in the work’s closing song, “Der Abschied” (“The Farewell”), death. In Mahler’s few remaining years, he completed his ninth symphony, and sketches for a tenth, with one completed movement, an Adagio. This time was also marked by a long-awaited session with Sigmund Freud. Mahler had made and canceled three previous appointments with Dr. Freud. This one he kept. They met in a café in the Dutch town of Leiden. (Not insignificantly, the town’s name, leiden, is the German verb meaning to suffer. )They then walked about the city for a total of four hours, as Mahler confessed of intimacy problems with his wife, Alma, most likely the impetus for seeking Freud’s insights. But Mahler also recounted for Freud his entire life story, his obsessions and anxieties. Mahler knew little about the still-blossoming field of psychoanalysis, but Freud later said that never before had he met someone who understood so quickly what it was about. By written accounts of both Gustav and Alma, their marital problems improved. Alas, Gustav died less than a year following the Freud meeting. 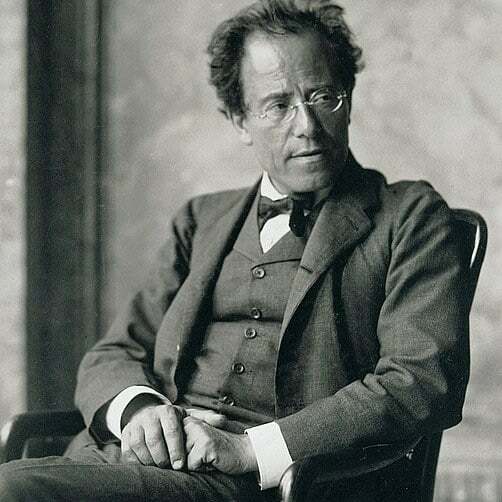 Furthermore, Mahler did not live to hear performances of either Das Lied von der Erde or his Symphony No. 9. The eminent maestro Bruno Walter, a friend and long a champion of Mahler’s music, conducted the premiere of Das Lied von der Erde in Munich on November 20, 1911, six months after Mahler had passed away. Walter also led the premiere of the Symphony No. 9 in June of 1912 in Vienna with the Vienna Philharmonic. It took thirteen years after Mahler’s death before Willem Mengelberg, the Dutch maestro and also a friend and great supporter of Mahler and his music, conducted the premiere of the Adagio from the unfinished tenth symphony in 1924 at the Concertgebouw in Amsterdam. Like Scriabin’s Poem of Ecstasy (performed in January) and Berlioz’ Damnation of Faust (performed in March), Das Lied von der Erde stands out as one of three titanic, rarely-performed highlights of our 2018-19 season. The concert dates are May 10 and 12, with our Music Director Manfred Honeck conducting. The vocal soloists are baritone Matthias Goerne and tenor Eric Cutler. The first half features the Beethoven Violin Concerto with the Norwegian violinist Vilde Frang. This program, quite frankly, is an embarrassment of riches. We hope you will join us.